Hi Christine, thanks for commenting. You raise a good point. Projects that have been funded outside of the planning domain can be recorded in OASIS. Within the new OASIS design there’s also a specific role for funders or those with interest/oversight of particular records such as Natural England or large infrastructure projects such as (potentially) HS2. This level of user (what we’re calling 2a) gets access to a relevant record prior to a project being formally signed off. The relevant HER (Level 2) will also have access and be able to incorporate into their systems as required. The last On-Line OASIS & BIAB management board report is from 24 Oct 2016 although the next meeting was Scheduled for April 2017. Where can I see the results of the latter please? I am increasingly concerned about the 40+ reports of mine awaitng HER verification. 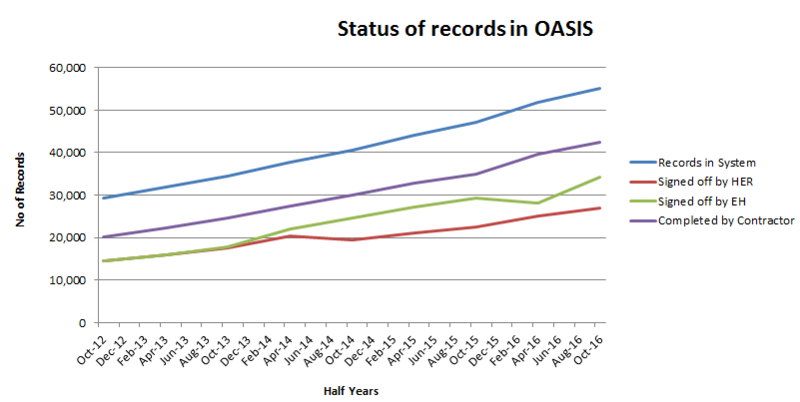 We didn’t write a blog after the last OASIS & BIAB Management board meeting but the monitoring reports are available on the OASIS website. The next Management Board meeting is tomorrow and we will produce a blog post following that.